Since 2009. Southwest Environmental; providers of professional environmental consultancy services to industry business and individuals. We have provided services to more than 300 clients in a variety of business / industry sectors. For a full list click here. Southwest Environmental Limited are committed to providing quality Environmental Consultancy services to a wide range of clients. Whether you are in industry, a land owner, a project manger, or a developer we offer a range of services to make your life that little bit easier . . . cutting through that red tape, leaving you to focus on your main objectives. SWEL offer Environmental Consultancy Services in the areas on Flood Risk, Compliance, Environmental Management, Sustainability, Contaminated Land and Planning. You can keep up to date with our projects and news on the southwest environmental blog. You can read about UK Environmental News and Environmental News from the Southwest UK, on our Dedicated Pages. Please feel free to telephone the office for a free initial consultation or to request a quotation. What do Environmental Consultants help their Clients with? Where are Southwest Environmental's Offices? How do Environmental Consultants help their Clients? Why should I engage an Environmental Consultant? Consultants, Consultant, Consultancy. What is the difference? Who works for Environmental Consultants? How do Environmental Consultants serve their Clients and the Environment? How do Environmental Consultants Help with Compliance Issues? How do Environmental Consultants Charge for their Services? Do Environmental Consultants have an Environmental Impact? 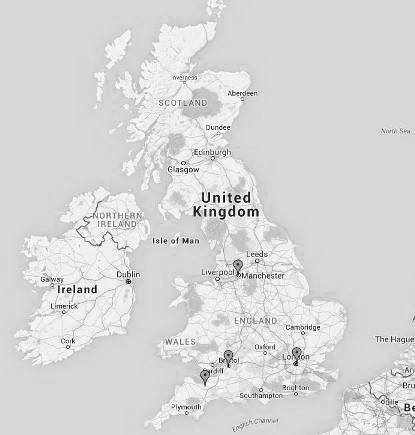 Which areas do SWEL Environmental Consultants cover? What do Environmental Consultants do to mitigate their impact? 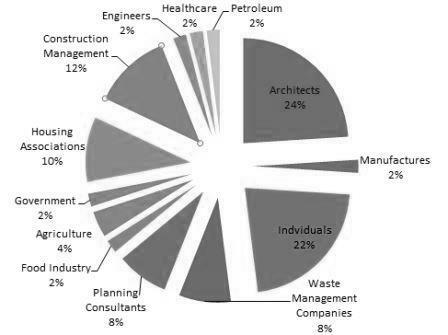 Who Do Environmental Consulting Companies Work For? How do Environmental Consultants help their Clients? The main aim of an Environmental Consultant is to deal with their clients needs as effectively as possible. 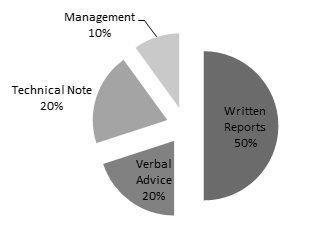 The pie chart to the right shows the approximate proportions of how environmental consultants help their clients. If you have any questions regarding Environmental Aspects of what you do then please give Southwest Environmental Limited a ring, or drop us an email. The first call is always free, if you have some site specific queries we can then arrange to send out a qualified representative to discuss your options. For further details on how we operate you can read our terms and conditions. Why should I engage an Environmental Consultant? Insufficient manpower to complete the task in hand. Insufficient expertise to complete the task in hand. You wish to gain a fresh perspective on your problems. You wish to become an industry leader in terms of you environmental credentials. You have been asked to compile a desktop study report by the LPA. Who works for Environmental Consultants? What makes somebody an Environmental Consultant? Training? Education? Experience? The answer is all of these, when you speak to someone at Southwest Environmental Limited you can be sure they meet all of the afore-mentioned criteria. We aim to employ staff with a minimum of an Honors Degree and Five years experience in a relevant industry. Environmental Consultancy is a very broad discipline and as such we will always assign a specialist Consultant to meet your requirements. How do Environmental Consultants Charge for their Services? However, for larger more complicated jobs pricing is site specific. For example, site works etc. may take longer dependent on the site's area. Environmental Consultants may charge with regard to the following types of work. For more complex project management or bespoke permit application it is not always possible to give fixed price. This is because before a certain amount of ground work is done for example contacting enforcement bodies, it it impossible to know the scope of works. How do Environmental Consultants serve their Clients and the Environment? So who are Environmental Consultants Interested in helping, our Clients or the Environment? The answer is both. But we understand that environmental obligations are an expense, that is why you will find that we offer competitive rates, and will not over complicate our reporting processes in order to increase our revenue. Business aside it can be said that Environmental Consultants are generally passionate about the environment, it is this combination between passion and understanding that allows us to do what is best for our clients and the environment. We often find that some of the compliance issues we deal with seam over complicated, and so we try to make this known to the regulators of the regulating body (The EA). Recently we have made contact with our local MP to make him aware that composting regulations are over complicated. What do Environmental Consultants do to mitigate their impact? Green Energy Tariff (Ecotricity)- Electricity is sourced from renewable sources. We don't charge mileage - Its tempting to charge 40p a mile when visiting site, but that might encourage us to drive more often, so we don't do it. We use recycled paper - Printing a report is one of the most material rich activities we undertake, all paper is source from recycled feed stock, or FSC woodland. Energy Conservation - As well as sourcing energy from a green source we also try to use as little as possible. What do Environmental Consultants help their Clients with? The Environment is in the news every day, not just the drastic headline grabbers like breaches in tailings dams, but the more chronic issues such as global warming, which are so inextricably connected to everything we do. Governments around the world have laid down environmental laws and environmental regulations to help protect the environment, and to make sure people responsible for damaging it can be held to account. For the average business, or individual this environmental regulation leads to lots of forms to fill in, risk assessment, reporting requirements . . . . and so on. All this paper work is a job in itself, and is quite often outside of peoples everyday remit, just as you may seek help from an accountant, you may wish to have an Environmental Consultant guide you in meeting your environmental obligations as an individual or business. Compliance is one area where Environmental Consultants can help. But when so many aspects of environmental management are linked to efficiency, low operational risk and lowering carbon foot prints . . why stop at what you are obliged to do? 1 - Company image can be improved via Environmental Management Systems. 2 - A company with sustainability as its prime motivator is more attractive for investors. Consultants, Consultant, Consultancy. What is the difference? 1 - a person who gives professional or expert advice: a consultant on business methods. 2 - a person who consults someone or something. 1 - a group of people who gives professional or expert advice: a consultant on business methods. 2 - a group of people who consults someone or something. 1 - the state of being a consultant; the position of a consultant: a consultancy with a government agency. 2 - a person or firm that provides consulting advice or services. 3 - consultation ( defs. 1, 2 ) . Do Environmental Consultants have an Environmental Impact? Most Environmental Consultants are human, at least in shape and form, and such they have an impact, they eat food which has a big environmental impact, they watch TV, and search the web. Use any form of Electrical Appliance, particularly computers. Heating and Lighting of Office. All of the above activities use operational and embodied energy / carbon, they may well have knock on effects down the supply chain and habitats, ecology, ethics. For example the diesel we put in our cars may be partially sourced from the Niger Delta where its extraction causes habitat loss and social unrest. How do Environmental Consultants Help with Compliance issues? There are a number of ways you can find out whether or not your activities / business is in compliance with Environmental Legislation. 1 - You can take it upon your self to undertake in depth scrutiny of your operation / business, and ascertain which legislation applies to your activity. Larger companies may have their own environmental team, and will not need the help of an Environmental Consultant. 2- You can engage an Environmental Consultant to Undertake the Work for you. There ere a number of advantages to engaging an Environmental Consultant to check your compliance, as they will know the best ways to deal with issues that may arise, and they will also know the most cost affective methods of bringing your operation in to compliance. It pays to be compliant, being out of compliance leaves you open to prosecution, increases environmental risk, and may effect your brand image. If you have any questions regarding compliance issues then please contact SWEL, for an informal discussion. The initial consultation is free of charge. If you are trained in Environmental Science or another Science such as Ecology or Geology, you might well wish to work for an Environmental Consultancy. But who will the Company work for? . . . .
Southwest Environmental Limited have had clients ranging from multinationals to individuals. Most of our works comes from management companies, who are looking to subcontract any number of services as part of there contract. These can be general management companies looking to outsource monitoring requirements, or construction management companies looking to "sub-out" planning, and environmental reporting. During 2017 for example our client base was comprised of numerous entities which are shown in the pie chart to the right. It is worth noting that as we are a reasonably small scale enterprise, our client base is likely to shift substantially from year to year. The pie chart also represents the number of jobs undertaken, and does not take in to account the earnings from each job. For example although 24% of or jobs come from Architects they generally commission multiple reports and as such make up a significant part of our turnover. Which areas do SWEL Environmental Consultants cover? 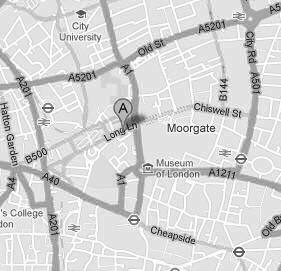 SWEL are based in London, Bristol, Manchester and Exeter and provide UK wide coverage. 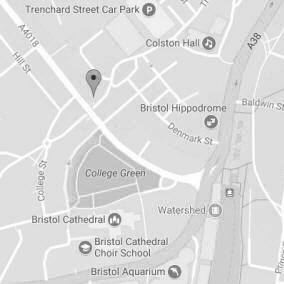 With offices in London, Bristol, Manchester and Exeter we are well placed to serve the southwest UK, London and the M4 Corridor. We have had clients in the past as far north as Edinburgh, and are not adverse to hopping on the train or a plain to come and visit. 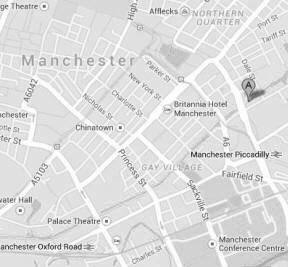 No matter where you are situated in the UK.